Also known as Gargantua. This is a two deck version of Klondike. Other similar games in Solitaire Plus include Canfield. • Forty-five cards dealt in nine tableau piles. • The number of cards per pile increases from one to nine from left to right. • Build exposed cards down in value and alternating suit color. • Exposed cards built down in value and alternating suit color can be moved as a unit if the bottommost card of the pile may be built on top of another pile. • A space made by clearing away an entire pile may be filled by only a King (plus the cards, if any, built on the King). • Turn up cards from the stock one or three at a time (see Variations below) in a discard pile. • The top card of the discard pile is available for play on foundations or tableau piles. • Unused cards in the discard pile are recycled after the stock is depleted. • Move the eight Aces to the row above the tableau as they are made available. 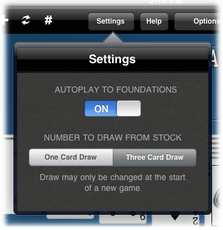 Tap the Settings button to select either one-card or three-card draw. Once a game is started, the number to draw cannot be altered without starting a new game. There is no limit on the number of times the stock may be recycled if cards are drawn three at a time. If only one card is drawn from the stock, then the stock may only be recycled once, for a total of two passes through the stock. Scoring: One point for each card moved to a foundation. Maximum score is 104. Chance of Winning: 1 in 3 games.